When you know how to build a generator, you will be able to supply yourself with some free electricity. You can build a small, experimental generator and, when successful, you can move on to making bigger generators, which will be able to provide more electricity and power more devices. Different kinds of generators use various sources of energy such as solar, wind, magnet, and others. Basically, one form of energy is harnessed and converted to another form of energy which is electricity. You will need some items, which you can get from a hardware store. Just keep in the mind that the bigger the wire length, the more electricity will be produced. A powerful magnet will produce more electricity than a low powered magnet. In this kind of generator, mechanical energy is converted to electricity. Assemble all the items together before starting, so you can finish the work at one go. Cover the shaft of the nail, near the head with insulation tape. Make similar sized holes in both cardboard circles, enough for the nail to go through. Push one of the cardboard circles down the nail till it reaches the end. Cover the end of the copper wire with insulation tape, leaving a bit free of tape. Push the other cardboard circle leaving a gap between the two to wind the wire. Tape both circles into place. Leaving some wire free and dangling, wind the rest of the wire round the nail and keep winding until it resembles a thick reel. Leave a similar length of wire free and cut the rest of it – this way you have two lengths of dangling wire. Tape the whole assembly together so the contraption does not fall apart. Remove the insulation from the two ends of the wire. Tape the wire with insulation tape to a bulb. Move the magnet rapidly near the head of the nail. This will generate electricity and cause the bulb to light up. When you want to build a bigger generator, you have to use the same principle. But you have to use a stand and a shaft to move either the copper reel or the magnet to generate electricity. You can build a shaft which can be hand cranked (like an old-fashioned sewing machine) to make a hand-cranked generator. By using two reels instead of one, parallel to each other and mounting them, you will be able to generate more power. Remember that this generates AC power, which can power very few devices as many gadgets work on DC current. Larger and commercially used generators use a motor, which is usually fuelled by diesel or gasoline. These are not environmentally friendly as they emit noxious fumes and pollute the atmosphere. Other generators may work on electricity or even steam. All generators use magnets, copper wire, and movement to generate electricity. 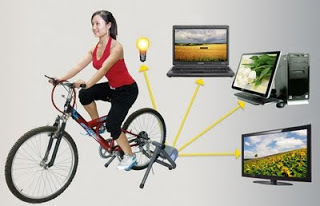 Sometimes a simple generator can use a stationary cycle’s pedal power to work. You have to be careful that no wires come in the way of the movement. The generator connects to the wheels’ axles and the movement helps to generate electricity. Once again, this has limitations, as you won’t produce a great deal of electricity by this method. How to build a generator can be an easy home project.